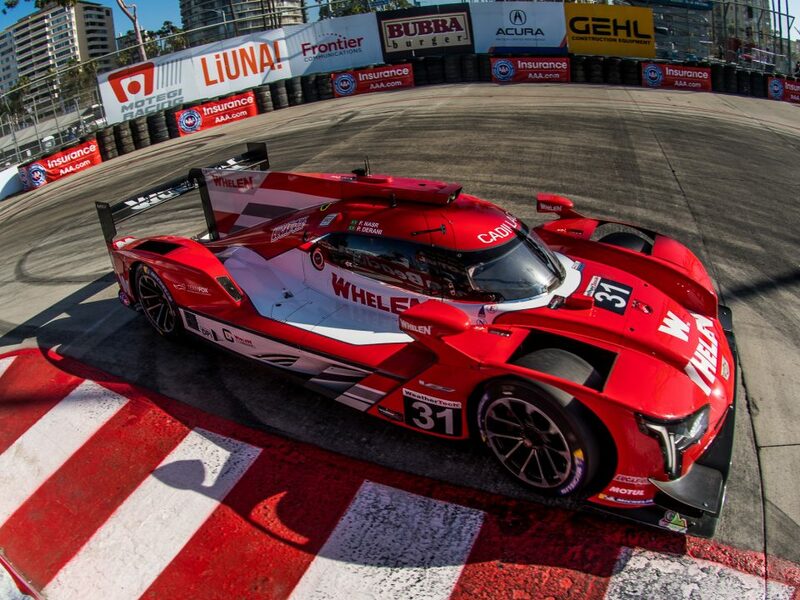 LONG BEACH, Calif. (13 April 2019) – History repeated itself on Saturday for Mustang Sampling Racing on the streets of Long Beach, with Joao Barbosa and Filipe Albuquerque combining great pit strategy and strong race pace to score their second consecutive victory in the BUBBA Burger Sports Car Grand Prix co-driving the No. 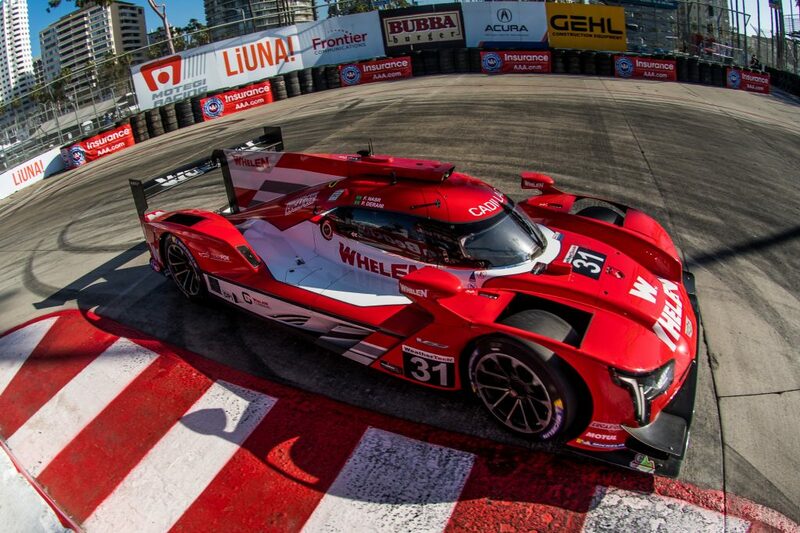 5 Mustang Sampling Cadillac DPi-V.R. A year ago, Albuquerque took the lead on his final stop and led the final 31 laps for the lone victory of the season for the No. 5 Mustang Sampling Racing team. Saturday, the team’s final stop put Albuquerque in position to lead the final 29 laps on the challenging 11-turn, 1.968-mile temporary circuit in the IMSA WeatherTech SportsCar Championship event. A punctured right-front tire brought Albuquerque into the pits on lap 39 – pitting ahead of the other competitors. The team changed only that one Michelin tire as Albuquerque charged back on track on his out lap to seal his spot out in front on lap 45. Albuquerque faced several challenges down the stretch, but magnificent driving through GTLM traffic preserved his lead on the way to a 0.740-second margin of victory. “It was very, very hard, because I starting to feel the tires dropping down,” Albuquerque said. “I started backing off a little to save the tires, but I made a mistake here and there so I said, ‘Forget it; I’m just going to push.’ My rear was all over the place, but it was good enough. It was an amazing strategy. We had a hard start with Joao, but he gave me a clean car and we came back. Barbosa started fourth but got caught up in traffic at the Fountain Turn on the opening lap, dropping back to eighth while avoiding contact. He managed to work his way back to sixth before his stop on the second of two cautions in the 100-minute event. “We had a real rough start to the race, and I was just trying to avoid chaos to give Filipe a good car for the end,” Barbosa said. “I started saving fuel from the beginning. We had great pit stops and great strategy. We stopped at the right time when the tire went down, and the team knew what to do. We knew it would take too long to take four tires, so we made up a ton of positions by only changing one. We knew we could do it. It’s all about the team—unbelievable job today. When we thought everything was totally lost, they turned it around. We brought the car back and they gave us track position at the right time, and we just finished the job for another win. After struggling with an electrical problem in the season-opening Rolex 24 At Daytona, the Mustang Sampling team took third in the Mobil 1 Twelve Hours of Sebring. Saturday’s victory boosted the two-time IMSA WeatherTech Champions to fourth in the unofficial points standings. The Mustang Sampling Racing team next travels to Mid-Ohio for the Acura Sports Car Challenge on May 5.